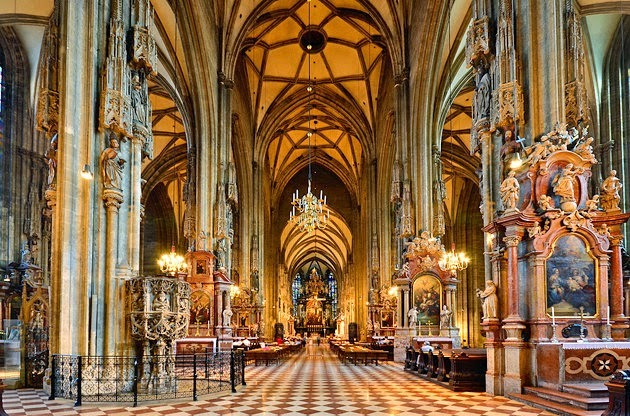 St. Stephen's Cathedral is the mother church of the Archdiozese of Vienna and the seat of the Archbishop of Vienna. Its current Romanesque and Gothic form seen today, situated at the heart of Vienna, Austria in the Stephansplatz, was largely initiated by Rudolf IV of Hapsburg and stands on the ruins of two earlier churches, the first being a parish church consecrated in 1147. As the most important religious building in Austria's capital, the cathedral has borne witness to many important events in that nation's history and has, with its multi-colored tile roof, become one of the city's most recognizable symbols. St. Stephen´s is always happy to welcome visiting choirs from all over the world, willing to share their music with them and help to raise money for the restoration of the Cathedral at the same time. For choirs from abroad it is exiting to sing in the Cathedral where W.A. Mozart and J. Haydn performed! 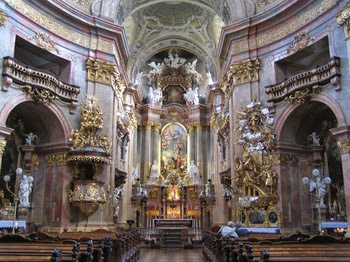 On Friday, will be a concert in the St. Peter's Church, or Peterskirche in German, a baroque Roman Catholic parish church located in downtown Vienna. The church it thought to occupy the oldest Christian sacred site in Vienna, as a church has stood here since the second half of the 4th century. A church of Saint Peter in Vienna was first mentioned in 1137. However, construction on the current building began around the year 1701, with the design having been inspired by St. Peter's Basilica of the Vatican in Rome. By 1722, most of the St. Peter's Church was finished and in 1733 it was consecrated to the Holy Trinity. Due to the confinement of available space, the church was built in a very compact form, with its oval interior housing a surprising amount of space. As the first domed structure in baroque Vienna, the dome of St. Peter's Church is 177 feet high and measured 98 feet in diameter.